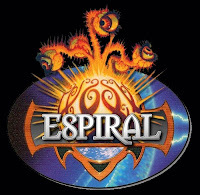 I like Guardians a lot, not only for the impressive artwork but also for the great and simple design of the cards, so being one of the few people that have this game in my country I decided to create this solitary game system called: "ESPIRAL". It is very easy to adapt to magic the gathering but I definitely recommend that you try Guardians first. Please do not confuse this as a simple variant in the rules, to play "ESPIRAL" you have to forget completely about the rules and check the cards with new eyes. - As many creatures as you want. - 1 Hero card (You can choose any kind of card as it will only be a graphical representation of the Hero). - 1D10, as many D6 as you can grab. - 1 Miniature to represent your Hero. 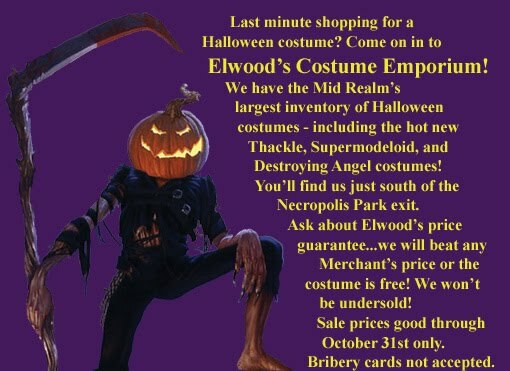 Our Hero has been summon to deliver an important message to the next town. To do so he will have to travel through dangerous territories, facing terrible creatures that will delay his delivery. But do not worry for balance should exist in the universe and through the aid of unthinkable allies he will meet his goal. MAP: Shuffle the lands deck and place the cards on spiral like on the image below starting with 1 stronghold and finishing with another one. HERO: Pick a card to represent your hero. It can be anyone really because it will only represent the image of your hero discarding the stats or other text in it. 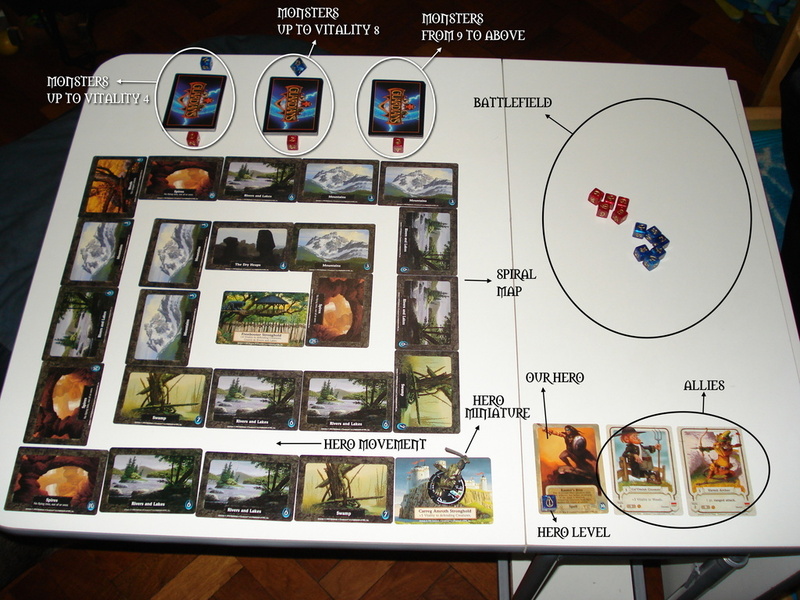 Place the card to the right of the map as in the picture above and put a dice on the bottom left corner with the number 1 on top to represent the starting level of the hero. CREATURES: Split the creatures pile into 3 decks. The first one containing creatures up to level 4 (vitality 4), the next one with creatures from level 5 up to level 8 (vitality 8) and the final one with creatures from level 9 to 30. Place a dice above each pile with the numbers 4 and 8 as a reminder. Below the first pile place a dice with the number 1. On the second pile a dice with the number 2 and a dice with the number 3 on the third one. This dice will represent the number of cards you will have to draw on encounters with this type of enemies. STARTING ALLIES: Take 2 creatures from the first deck and put them to the right of your hero. These will be the starting sidekicks that will help you through the adventure (if they survive that long). MINIATURE: Finally place the miniature that will represent your hero on the first stronghold. Now it is time to begin with the game. Your Hero moves 1 landcard at a time and throws 2 dice (DICE TRIAL). If sum of the numbers in the dice is bigger than the number on the landcard the hero has an "ENCOUNTER" if not the hero can "RECRUIT" OR "HEAL". RECRUIT: If you have passed the Dice Trial you can recruit 1 member from the FIRST DECK. HEAL: If you decide not to recruit you can heal all your allies 1 level by leveling down your hero 1 level. You can never heal more than the original vitality of the allies. This effect can be done several times (1 healing level per hero level - 1). For example: Your hero is level 5 and you decide to heal all your creatures 4 levels leaving your hero on level 1. Your Hero can never go back. The mission is too important. - up to 4: he draws 1 card from the first deck. - up to 8 but more than 4: draws 1 card from the first deck and 1 card from the second deck. - more than 8: draws 1 card from each deck. STEP 1 - ENEMIES) Place the enemies in the "Battlefield Area" as shown on the image above. They attack first. STEP 2 - ENEMY STRENGTH) Sum the vitality numbers of all the enemies and take up to 6 dice to do the attack (if the summed vitality is more than that simply ignore the rest). STEP 3 - ENEMY ATTACK) Consider for both sides a "STRIKE" on 5 or 6 and a "FAIL" on anything else. If a creature's vitality is reduced to 1 it does a berserk attack. Use for this 50% of the original vitality of the creature rounded down to define it's strength. STEP 4 - RESOLUTION) For each "5" or "6" the enemy scores you will have to pick one or several creatures to receive the damage. None of the creatures that have been damaged will be able to counter attack this round so be wise. Check the vitality of each of your creature and assign the damage by placing a dice on the character over the vitality number with the new number of the creature's vitality minus the attack hits. a) If you assign all the damage to the first creature it will die immediatelly but you will be able to fight with 5 dice (4 from the second creature plus 1 of your hero). b) If you decide to assign the damage to the second creature that will leave it alive but with a vitality of 2 and it won't be able to counter attack leaving you with 3 dice (1 from your hero and 2 from the first creature). c) You can decide to split the damage between your 2 allies but that will leave them unable to counter attack so only the 1 dice of your hero will be used. d) You cannot assign damage to your hero since he is still level one (If your hero is on a level higher than one, he can be assigned damage by leveling him down 1 level per damange, yet he still can counter attack). Your tactical decision will make the difference. You cannot assign more damage to an ally than the vitality of that ally. STEP 5 - DEFEAT CHECK) If you are forced to assign the last damage to your hero and he dies it is the end of the GAME. STEP 6 - COUNTER ATTACK) Once you have distributed the damage it is the time for your party to attack. Sum the vitality of all the members that haven't been damaged during the enemy's attack and throw up to a maximum of 5 dice. STEP 7 - RESOLUTION) As you have done with your hero and allies you can do with your enemy only that this time it will be you who will pick the targets of your attack. You can assign as many damage as scored to any number of creatures. Put a dice on each of them marking the new vitality of the creatures. STEP 8 - VICTORY CHECK) If the creatures that attacked you have died the battle is over and your hero has level up. Simply change the dice that is showing your Hero's vitality to the next number. If the creatures that attacked are still alive a new round of combat begins. Each creature killed is placed under the deck it belonged for further use. Some elements of the original game are kept to make the game more interesting, but not all so watch closely and do not cheat. OFF-COLOR BONUS: If the hero's party or the enemy's party is matched up in combat against at least one creature (on the opposite party) whose border is the same color as the off-color patch next to the Vitality Shield, then the number in that off-color patch is added to its vitality. For example: I have 1 ally that has a black patch with a number 3 on it. The enemy has an External (dark bordered creature) in it's party. So that ally has it's vitality plus the number in the black patch. Do this on each of your creatures as well as on the enemy's party. Remember an important rule: If your creature has an off-color bonus you might add more damage than the original vitality of the creature up to the new vitality number. But the off-color bonus will leave as soon as the battle is over, so if by then your ally has a negative vitality value consider it eliminated. LAND BONUS: If a creature (Ally or Enemy) has a bonus depending on the land you are fighting over, add that bonus to the vitality of the creature. That bonus leaves as soon as your hero moves to the next Landcard. VERSUS BONUS: If a creature (Ally or Enemy) has a bonus against a specific creature (example: +10 vitality vs. Undead) and the opposite party counts with that creature as a member apply that bonus to the creature with that ability. That bonus leaves as soon as the battle is over. IMMUNITY: If a creature (Ally or Enemy) has an immunity against another creature that is in the opposite party it cannot be assigned any kind of damage until the creature it has immunity against is killed. RANGED: If a creature has points on range attacks this creature can attack eventhough if it is assigned damage but instead of using it's vitality to do so use the ranged attack points. If it has not been assigned damage use the vitality points as normal. Remember that on the "Woods" no range attack is allowed. I hope you like the game. As you will size you can adapt this adventure to many other card games. 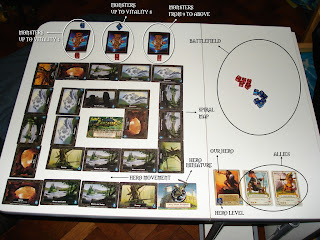 With magic the gathering you can include even a defense system in which you attack with as many numbers as the attack level of your creatures and the enemy defends with as many dice as his defense number. Explore the possibilities. It's good to have fun with others but if your deck is collecting dust why do we have to wait for others to be in the mood when a cool adventure is at the doorstep. Very clever! I do wonder why you would arrange your cards in a spiral when the game tells the story of a journey; wouldn't it make more sense to create a long line or curve, perhaps even with a split in the center to allow the player to select one of two paths that might offer better terrain bonuses? In any case, I'm glad to notice there are actually a few of these kinds of adventuring variants cropping up for the Guardians CCG, which really deserves as much exploration and remodeling as it can get. Guardian's theme and artwork are absolutely nonpariel, and it is truly a shame that the complexity of its ruleset would render it unable to compete with Magic: The Gathering (an overrated game with all the flavor and balance of McDungeons & Dragons).